“Don’t get in my bubble,” they say to each other – and to me sometimes. And the way they say it, playful yet serious, is one of my very favorite things. The way boys banter and set boundaries through humor is one of the true delights of being a mom of sons. “I’m not tellin’ that,” when I try to ferret out information about what’s going on with the people they hang out with – “That would be gossiping,” they say. Respecting healthy boundaries can be a mine field of relationship-risk because sometimes boundaries create conflict on both sides. Then there is the, “Mom, I’m not dressed” when I try walking into my bathroom where they are showering, and, apparently, over-night my little boy felt he had become a man who needed his privacy. Ah, where the chasm between mom and son widens, not like the ocean yet, but like a river, where you are on one bank and he on the other. Sigh! Developing boundaries. Discernment. My sons grow and develop boundaries that keep me out. Yes, healthy. Yes, to a point necessary. However, boundaries go both ways. If you have ever played croquet, then you understand that boundaries are indeed a sticky wicket we all have to deal with. And, just in case you do not want to make scones because. . . well, they sound so scone-ish – then call them sweet biscuits. Who would not want a sweet biscuit! Call them what you want – but, if you my son, never, ever tell me your scone recipe is better than mine. Sniff! He popped my bubble!
. . . .I recognized the love offering, but was somewhat dismayed – how do you handle that situation? Wanting to be proud – because it was pure sweetness out of both that prompted the gift offerings. Yet, disagreeing with the results! Granted, his scones were nicely done. Were they better? I was so busy trying to re-bubble my bubble, I could not honestly say. So, while you chew over that boundary issue, listen to a little Spike Jones, you just might like to try my scones! If you have a better recipe, please share – it won’t pop my boundary bubble – unless you’re my son! Sigh! There is always a story behind the recipe at our house! Ya’ll come back now, Y’hear! Combine first 4 ingredients; cut in butter with a pastry blender until crumbly. Add whipping cream, stirring until moistened. Turn onto lightly floured surface; knead 5 or 6 times. Roll to 1/2 inch thickness. Pat into an 8 to 9-inch circular greased cake pan. Score into triangular pieces before cooking. Or, use a melon-ball sized-scoop, and place on a greased cookie sheet. Bake at 375° for 15 minutes or until golden brown. 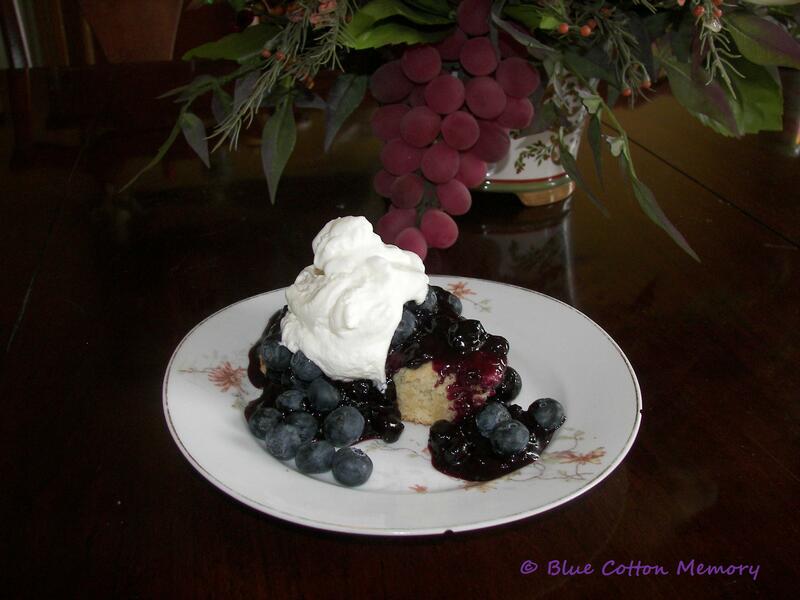 Serve with Blueberry Sauce and whipped cream. I like to use fresh un-cooked blueberries or strawberries sprinkled liberally over the sauce. Also tastes great in a bowl with 1/4 cup milk, sweetened strawberries that have been sliced and sugared. 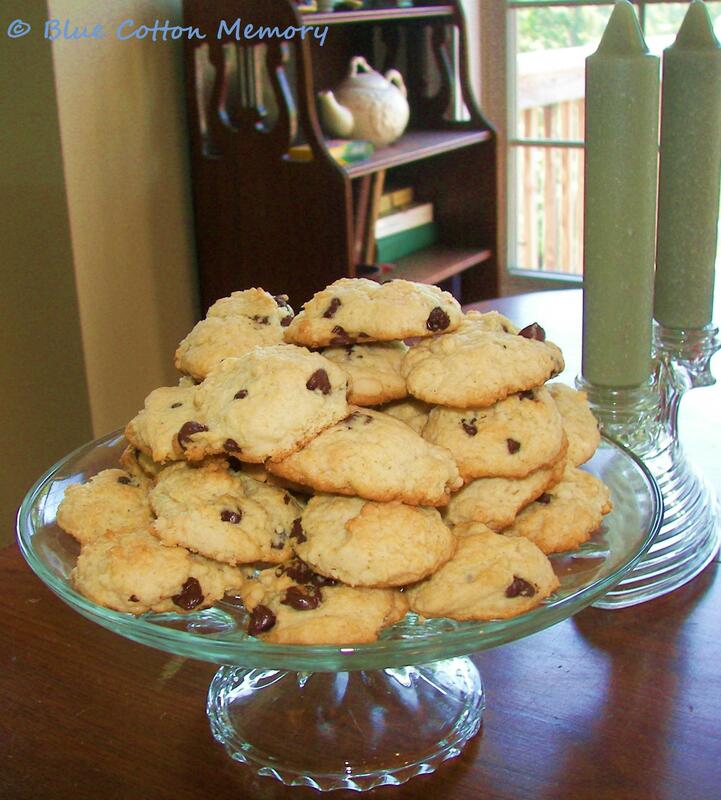 Add 1/2 bag of chocolate chips for scone balls or cookies. Add everything to a saucepan and bring to a simmer. Simmer for 8-10 minutes or until the blueberries pop. Whisk the boiling water and cornstarch together to make a slurry. Stir the slurry into the blueberry sauce and continue simmering for 2-3 minutes to thicken. Remove from heat and set aside. Place beaters in the freezer while the Heavy Whipping Cream chills (about 15 minutes). Beat until stiff peaks form. Be careful or you’ll end up with butter. When done, dollop a generous amount over your fruit sauce. Just stopped by to let you know it was ok and I see your lovely scones! Oh how I wish I had one right now for dessert! Thanks for mentioning my sauce and for the kind words. They would be a perfect match! These recipes sound so delicious!! I don’t bake very often (I’m a former fat girl, living alone… Unless I can make just one of soemthing, having a big plate of yummy baked goods is a recipe for disaster!) but I do love to bake when I have company… like I will this weekend! Printing, saving, and planning to go shopping 🙂 Thanks for sharing!! Thank you so much for coming to my blog and sharing advice about how to help my son cope with stress. Your advice was so sound. Of course, now that I visit you and see you have FIVE sons it makes sense. I have two boys and they are 3 and 1. Our boundaries are rather small, maybe like a little stream of water, but I am well aware that they will grow and your post is so on point. I may never stop seeing them as my babies, but I won’t be able to hug and kiss and tickle them they way I do now. Better enjoy it now! Is there anything better than blueberry scones? I love your “don’t get in my bubble” I think that would be a healthy approach between my first born – born to be in control and power; and my second born – in the moment, impulsive. I never realized how strongly some of my boundaries were until I became a stepmom. I tell you, I don’t think I really used the word boundary until then – but I sure have since. Boundaries are intersting and different for each – and each invasion is quite unique (like your scone gift). I guess each one has to be dealt with based on its own merits. Sometimes wounds just have to be licked and move on; sometimes the crossing over has to be confronted. Thank you for the scone recipe, I have to get up the gumption to tackle – hopefully will not turn out like the first homemade biscuit I ever made – hard as a rock! Oh my those looked good. I LOVE scones. So not on my diet though! Thanks for stopping by on my SITS day! Hope you have a great week. Hey I’m all for a scone anytime!! I remember well when my son – now 29 – went through these stages. It was a little bittersweet. He still carries that “bubble” thing! Thanks for stopping by to visit me today! You have an elegant blog and beautifully gentle style of writing. Oh I am SO going to try these!! I lurve scones and I can’t imagine your sons being any better! Just be glad your son is bringing you scones. Mine brings me boogers and bugs. I’m not much of a baker but these look amazing. I may have to try it (or my husband will be happy to). We both cook, but he bakes 🙂 Five boys…wow. We’re convinced if we were to have third it’d be another girl. Some people are just attracted to one gender I guess. And I always thought I would have boys!